U.S. Republican presidential candidate Donald Trump has once again praised Russian President Vladimir Putin and declared that he had been a better leader that U.S. President Barack Obama. 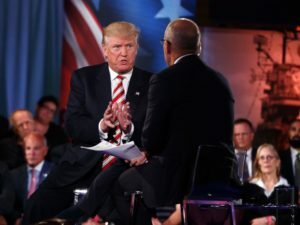 Putin is “very much of a leader,” Trump said in a televised presidential forum moderated by the U.S. network NBC on September 7, where he and Democratic nominee Hillary Clinton were separately grilled over their national security credentials. Trump said Moscow wants to destroy Islamic State as much as Washington does, and repeated his intent to work with Russia to defeat the militant group in Iraq and Syria. “If we had a relationship with Russia, wouldn’t it be wonderful if we could work on it together and knock the hell out of ISIS? Wouldn’t it be wonderful?” he asked. Trump said if Putin “says great things about me, I’m going to say great things about him.” Trump added, however, that Putin’s compliments would not influence his decision-making as president. Trump, who earlier in the day proposed a massive increase in U.S. military spending, said the military’s leadership “has been reduced to rubble” under the Obama administration. Clinton, appearing before an audience of military officials and veterans who were provided an opportunity to ask questions, was grilled about her use of a personal e-mail server while she was secretary of state and her handling of classified information. She defended her behavior, saying she did “exactly what I should have done,” but stressing that she had not improperly handled classified information. Clinton vowed, if elected, not to send American ground troops back into Iraq or Syria. “We are going to defeat ISIS without committing American ground troops,” she said.